Canada is one nation, but it is in many ways two communities, one Francophone and the other Anglophone. We employ a formal model of “ideology” and analyze how nationality is constructed in people's minds. 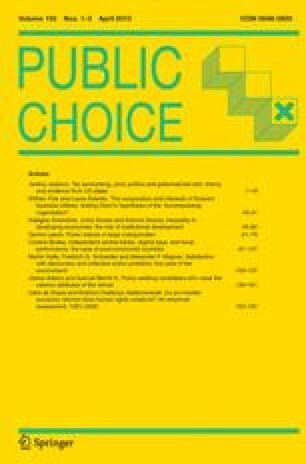 The magnitude of the changes in expressed “preferences” in terms of ideology depends on the salience of the new issue, the extent to which it confirms with the existing ideological cleavage, and the difference between the perceived status quo on the new dimension and the voter's most preferred alternative. Using data from the 1993 Canadian National Election Study, we consider the relative importance of different policy dimensions in explaining voting decisions among educated Canadians. The issue of Quebec sovereignty, alone, is shown to have significant power for predicting vote choice. A plausible explanation, confirmed here by regression analysis, is that Quebec sovereignty “stands” for other issues in voters' conception of Canadian politics. 3.Department of Political ScienceWashington UniversitySt. LouisU.S.A.